1. Pierce the skin of the pork all over with a skewer, then pour boiling water over it and pat dry with kitchen paper. Make slits in the prunes and push the sage leaves into the centre of the slits. 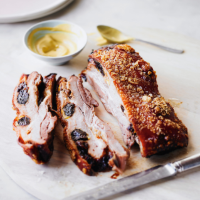 Make slits all along the side of the belly pork where the flesh meets the fat and push the stuffed prunes and lemon slices in as far as possible. 2. Preheat the oven to 200°C, gas mark 6. Place the pork in a sturdy roasting tin that fits it snugly. Roast for 20 minutes. Lower the temperature to 150°C, gas mark 2, then cook the pork for a further 3-5 hours until the skin is tender and golden. 3. Remove the pork from the oven and leave to rest in a warm place for at least half an hour for the juices to settle. Drain off the excess oil from the tin, add the cider and mustard to the pan juices, place over the heat and scrape up all the bits in the pan. Boil until reduced by half, then check the seasoning and strain through a sieve. Slice the pork and serve with the pan juices.